Code 6 by Master Fog is by far the longest lasting water based fog fluid on the market. We can't help but say, this stuff is just ridiculous! Master Fog's Code 6 has a hang time of up to two hours, resulting in less fluid consumption and less wear and tear on your fogger. With Code 6 you will use a third of what other products have to offer, while still keeping the same atmospheric effect at your event! Here at Master Fog, we've worked hard at concocting an odorless, thick white fog with great dispersion properties that just doesn't seem to want to go anywhere. When we say it hangs for hours well........ It hangs for hours! It also doesn't wreak of gross chemicals from who knows where. All of Master Fog Fluids are made right here in the U.S.A and use only pharmaceutical grade ingredients. Code 6 fog fluid is being used in many Theme parks, Haunted Attractions, Night Clubs, Laser Tag Arena's, and it's also being used for training purposes in the Military, Police and Fire Academy's. 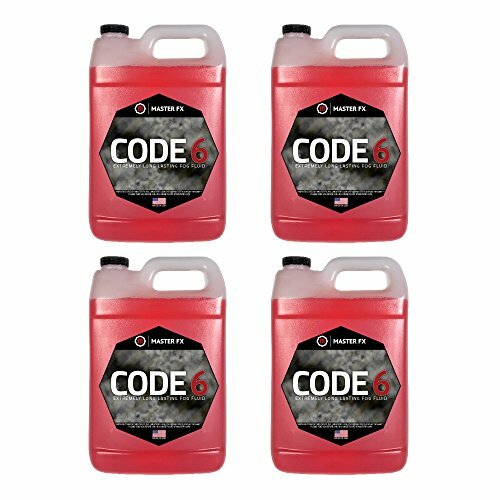 Code 6 is recommended for use in Larger sized facilities or outdoor spaces. If you have any questions about this product by Master FX, Inc., contact us by completing and submitting the form below. If you are looking for a specif part number, please include it with your message.